Philadelphia's 10-year real estate tax abatement, an incentive program meant to drive construction and encourage property owners to improve their homes, has been a force in residential growth across the city and has ultimately boosted tax revenue since its implementation, according to a new report commissioned by the Building Industry Association of Philadelphia (BIA). Put in place in 2000, the 10-year tax abatement exempts all improvements to real estate for 10 years following the completion of renovations. 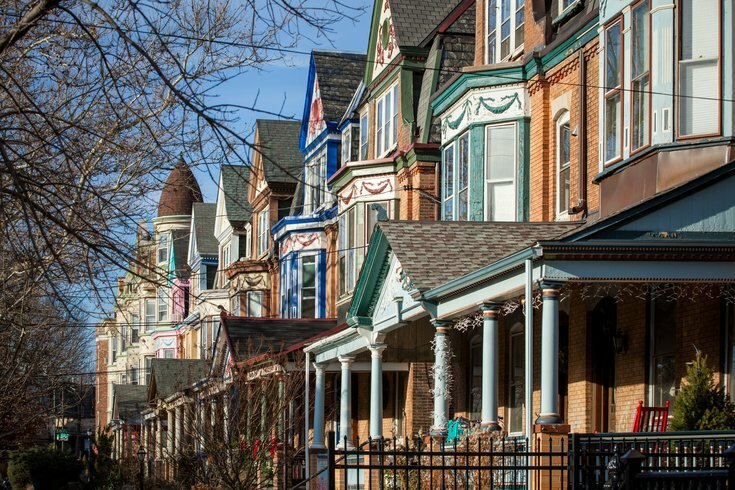 Approximately 20,000 properties in Philadelphia have taken advantage of the program, whether through new construction, conversions or basic home improvements. In the years since the incentive became available, real estate development in Philadelphia has more than tripled, according to the report, increasing by 376 percent even as construction fell 11.25 percent in surrounding suburbs without such a program. Acting as a stimulus for new construction and home improvement, the program has seen abated properties rise to approximately 11 percent of the city's total assessed value of real estate, or about $12.2 billion. The value of properties with active abatements, about 15,607 spread throughout Philadelphia, is now $8.757 billion. 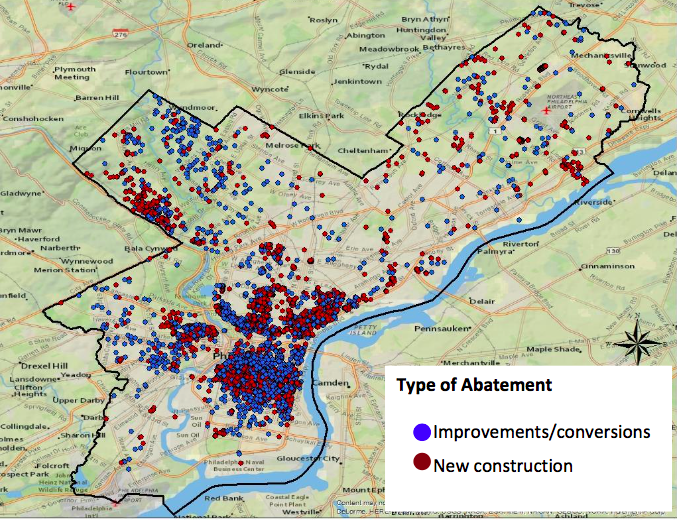 Map of currently abated properties under Philadelphia's 10-year tax abatement program. Once improved properties complete the 10-year abatement, they instantly add increased value and tax revenue to the city. Philadelphia collects another $48.1 million in annual real estate tax revenues from properties with expired abatements. That's expected to rise to $169.4 million by 2026, when all current abatements have expired. While most abated properties are in Center City, where there is abundance of high-rise condos and hotels, single-family abated properties have played a major role in reshaping real estate markets in neighborhoods including Fishtown, Kensington, Northern Liberties, Manayunk and pockets of West and South Philadelphia. Even with a median home value of $145,000 in Philadelphia as a whole, the tax abatement program has not been dominated by condos and properties worth upwards of $1 million, the study found. In fact, the typical abated home is a single-family residence with an assessed value between $200,000 and $300,000. A full 25 percent of abated properties can be classified as "workforce housing" within the context of local assessed values and neighborhood incomes. “Throughout the country, we have seen how homeowners benefit from tax abatements," said Granger MacDonald, chairman of the National Association of Home Builders, which supported the first of the three BIA studies along with the Pennsylvania Builders Association and the General Building Contractors Association. "Philadelphia is a perfect example of how getting tax policy right can help drive investment and homeownership in communities."